This past weekend, I flew Jet Suite X for a quick getaway to Northern California prior to Super Bowl LIII. As many can attest, living in California provides endless opportunities of adventure; I am someone who takes full advantage of that. I love traveling and seeing as many nooks and crannies of the world as I possibly can. I arrived in Oakland on Friday evening around 6:00 PM, after getting in some quality reading due to the flight only being 50 minutes. For those curious, I am currently reading The Power of Self- Discipline by Brian Tracy. Upon arrival, I checked into the Hilton Oakland Airport, an affordable option I would recommend to those looking to keep their budget allocated to the fun stuff. Next time, however, I’m looking forward to staying at the St. Regis San Francisco which is luxurious AF (and not as budget friendly). As always, I was starving once I got the hotel and was ready for dinner. Typical Stephanie. I didn’t exactly want to cross the bridge into San Fran that night because all we all know how California traffic can be. Instead, I began seeking a local spot to grab a bite in Oakland, making Yojimbo Sushi a perfect choice. Sometimes while traveling, it’s hard to gauge the best location to fit one’s current mood, but the fact that this spot had a line out the door reinforced how my instincts were on point. During my short and sweet time up north, I only had one thing on the schedule and that was a Lakers vs. Warriors game, set to take place Saturday night. In the mean time I had a day to fill so I had to take full advantage. Saturday morning, I made my way over the Bay Bridge to San Francisco. I ate breakfast at The Grove San Francisco, which I will happily recommend 10x over. Following my delicious eggs Benedict, served “Davey’s style,” and hand-pressed orange juice, I walked two blocks to The San Francisco Museum of Modern Art. Even though it began down-pouring by the time I arrived, the museum’s seven floors greeted me with plenty to take my mind off the weather outside. Pieces by Salvador Dali, Pablo Picasso, Henri Matisse were just a few highlights of the collections the SFMOMA showcased, helping transport me to another vibrant world to get inspired by. Needless to say, there was a lot to do and engage with at this museum. After exploring (and capturing plenty of photos), I decided to break up the day with some tea. What I learned was that the admission of the museum allows you to come and go as you please. Because of this policy, when it was time to head back and get ready for the game, I was able to pay it forward and gift my ticket to another art-hungry soul. 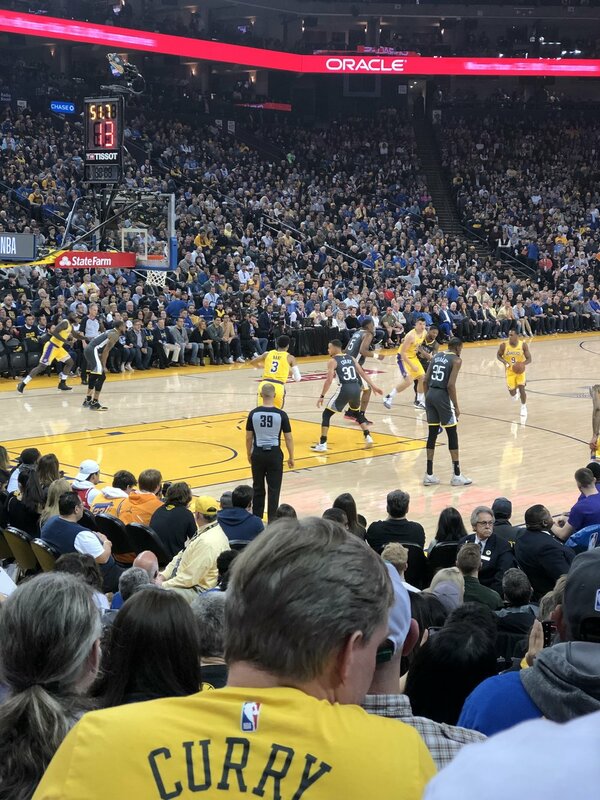 Interestingly enough, the couple who I had begun talking to outside of the museum who I offered my tickets to had just had an encounter with the Lakers team outside, further highlighting the spontaneous energy that surrounded the forthcoming game. While I’m typically not a fan of either team, per se, I chose to show up repping purple and yellow for this special occasion. With that in mind, I was really looking forward to watching LeBron ball out. Unfortunately, once I took to my seats, I found out he was sitting this game out in order to continue recovering from a recent injury. Reminder, even LeBron has to take a break every now and then. Oh well! As one sports game ended, my mind instantly jumped to the next. When I had woken up Sunday morning, my excitement continued to grow as it was time to head back to L.A. for the Super Bowl, baby! As exemplified by my time in Northern California, it’s easy to fit a lot into a short amount of time. While I’m pleased with how my trip went, these photos serve as a reminder that a fun packed weekend is just one 50-minute flight away!